Weighty Matters: Dr. Alexander Hughes. Spinal surgeon. Nutritional genius? Dr. Alexander Hughes. Spinal surgeon. Nutritional genius? While of course there are lots of bad doctors out there, it's stories like this one that make my blood boil. Well it's about an enterprising young physician named Dr. Alexander Hughes. 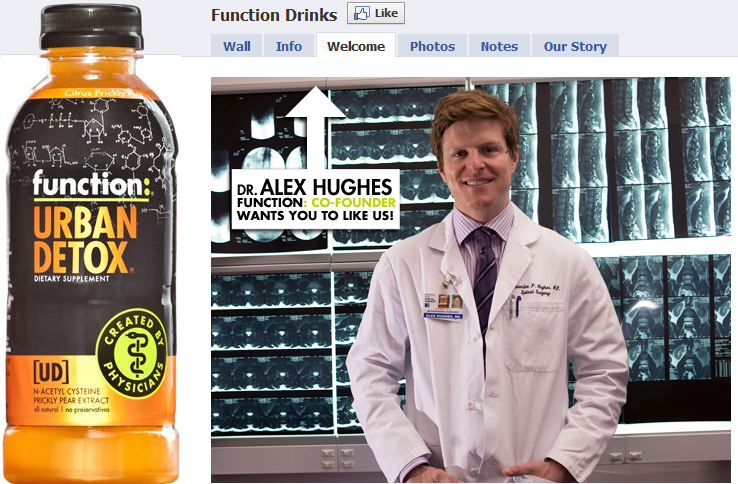 According to Dr. Hughes' publicist Kelly Striewski of B|W|R Public Relations (whose assistant Logan Hayes kindly emailed me the story and clearly didn't bother to spend even a moment reading my blog to see what I'm all about), Dr. Hughes is "attractive" and "young", and apparently he's also created a line of functional drinks (called unimaginatively "Function Drinks") that prominently report on their labels, "Created by Physicians" and purport to do all sorts off wondrous things. So who's Dr. Alexander Hughes? According to his employer the New York's Hospital for Special Surgery, Dr. Alexander Hughes is an assistant attending orthopedic surgeon who specializes in the surgical management of traumatic, degenerative, and deformity-related conditions of the cervical, thoracic, and lumbosacral spine. His website also provides a long list of conditions and disorders with which he's familiar. Not shockingly for a spinal surgeon, but surprising given the drinks he's peddling, nutrition's not one of them. Interestingly his profile reports that he has "special expertise" in, "enhancing patient experience and outcomes through innovation and clinical research.". So does his publication list include any clinical research having to do with nutrition or functional ingredients? 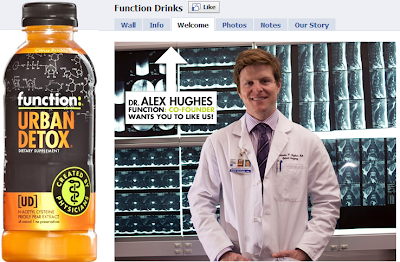 Yet his Function Drinks - Urban Detox, Light Weight, Shock Sports and Alternative Energy, all sold explicitly on the back of Dr. Hughes' medical degree, apparently contain functional ingredients that will cure hangovers, burn fat, block sweet food cravings, "scrub smog", "speed your natural recovery", release energy and, "support proper circulation". How a physician who purports to care about research is comfortable selling sugar water with fancy sounding ingredients with clinically unsubstantiated promises is beyond me. So too is how he can look his colleagues in the eyes and why the Hospital for Special Surgery, regardless of his surgical skill, wants a physician like that on their roster. I also wonder whether or not his enterprise is even kosher as I'm pretty sure that here in Canada, were I to pimp out my degree on products making non-evidence based health claims, I would be censured by the College of Physicians and Surgeons of Ontario and forced to take my name and degree off of those products immediately lest I lose my license to practice medicine. Remember folks, just because someone has a medical degree, it doesn't mean you should inherently trust them.